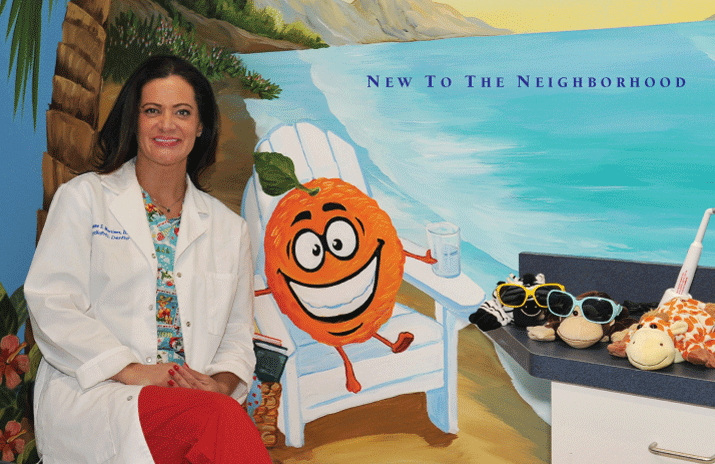 Dr. Joanne Martinez, DDS specializes in pediatric dentistry at Pediatric Smiles of Orange. In practice in Aliso Viejo since 1999, Dr. Martinez focuses on making a trip to the dentist a fun experience, as evidenced by the colorful murals at her new office on East Chapman. Dr. Joanne Suarez-Martinez, DDS is all smiles when she talks about the thousands of patients who have benefited from her state-of-the-art, pediatric dental practice throughout the years. In business since 1999, Joanne recently opened a new office in Old Towne. Colorful murals on the walls, toys in a treasure chest and TV screens on the ceilings are just some of the kid-friendly amenities at Pediatric Smiles of Orange. With a second office in Aliso Viejo, Dr. Martinez offers pediatric dental care for infants, children and teens at both locations. Services include digital radiography, which is a better option for children than traditional radiographs. She also does white composite fillings that provide a strong and durable restoration for the tooth. Additionally, sealants are used to protect teeth and prevent cavities. Families love coming to Pediatric Smiles of Orange. Toys in the reception room help keep kids entertained. The office also has video games and iPads for patients to play with. Dr. Martinez graduated from the prestigious UCLA Dental School, where she earned her DDS degree. She then received her Pediatric Dentistry certificate from USC. Having practiced in South Orange County for 17 years, she decided to branch out and open a second location in Old Towne. A parent herself, Dr. Martinez understands the importance of compassionate and caring dentistry.